Be Prepared for a labor shortage. At HindSite, we’re a data-driven company. We like to make decisions based on data. 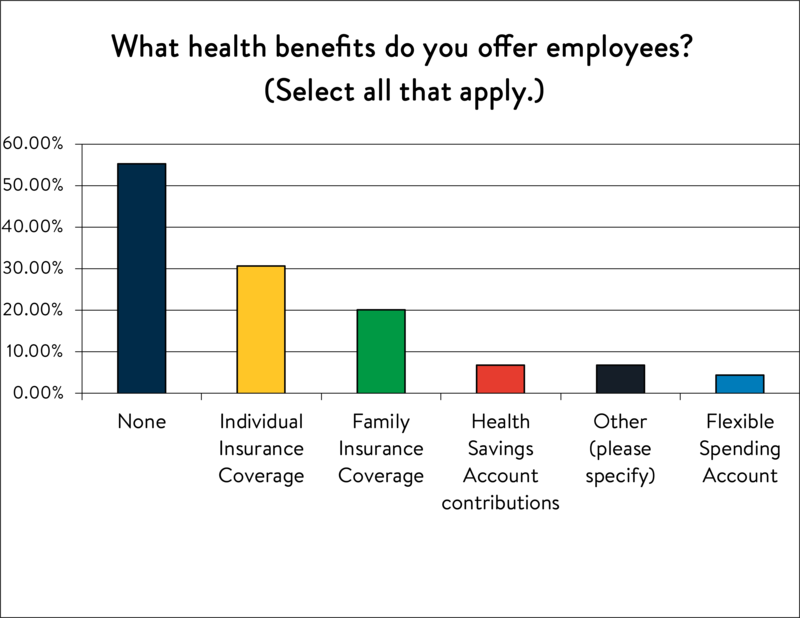 To help you do the same, every year we conduct the most comprehensive survey of the green industry available and compile the data into a report we call the Green Industry Benchmark Report. It’s full of great competitive insights that can help you grow you revenue and profits faster. The first lesson we learned from the Green Industry Benchmark Report is that you better be prepared for a labor shortage. That was apparent in a number of the questions that we asked. First, attracting and retaining employees was the #1 issue reported by 36% of respondents, more than double that of inefficient operations and up nearly 10% over last year’s results. In the past, marketing to acquire customers was either the number one issue or within a few percentage points of attracting and retaining employees. So the takeaway is that it’s becoming easier to find work and a lot harder to find employees to do the work. It wasn’t just that response that highlights the issues businesses are having finding and keeping employees. 80% of respondents said they’re raising prices and the number one reason given is because of rising labor costs. Another side effect of a tight labor market is wage inflation. Because employers can’t find employees to do the work, they need to protect existing employees by increasing their wages. 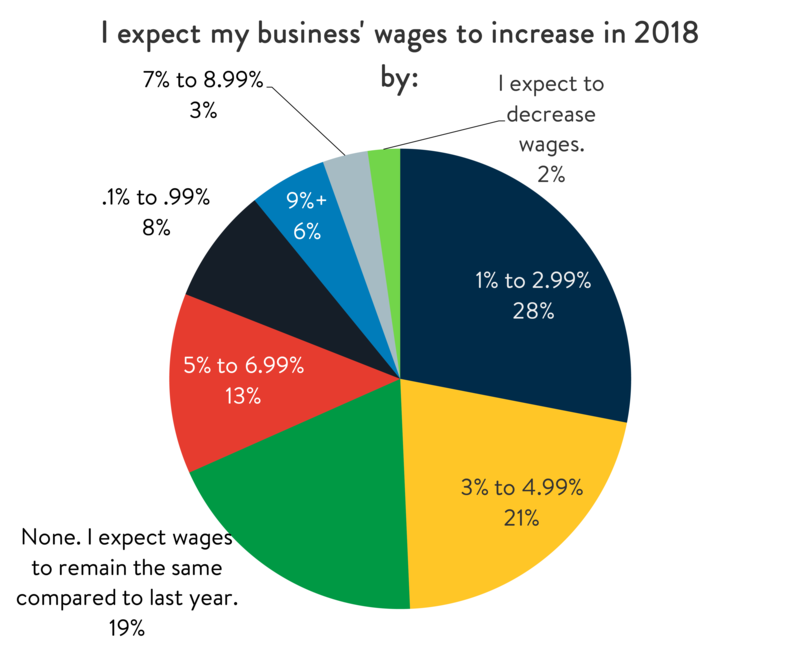 As a result, 43% of respondents expect their employee wages to increase by more than 3% next year and nearly 20% expect wages to increase by 5% or more. 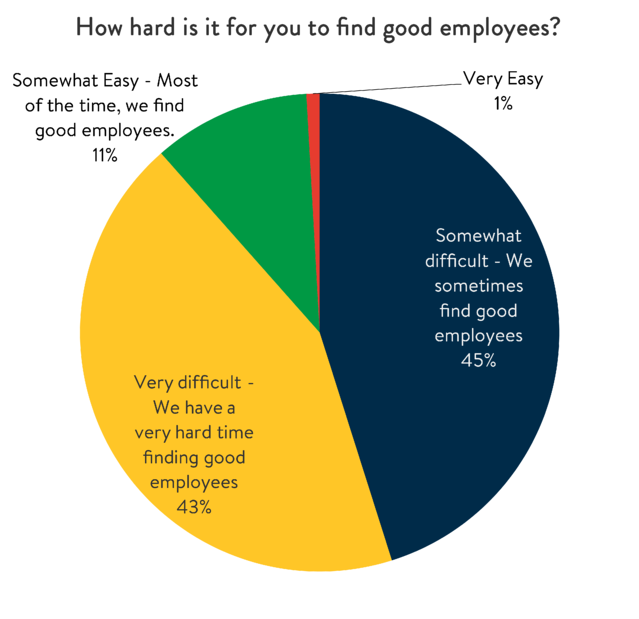 Plus, according to 88% of survey respondents, it’s either Very Difficult or Somewhat Difficult to find good employees. Just 12% said it was either somewhat or very easy to finding good employees. 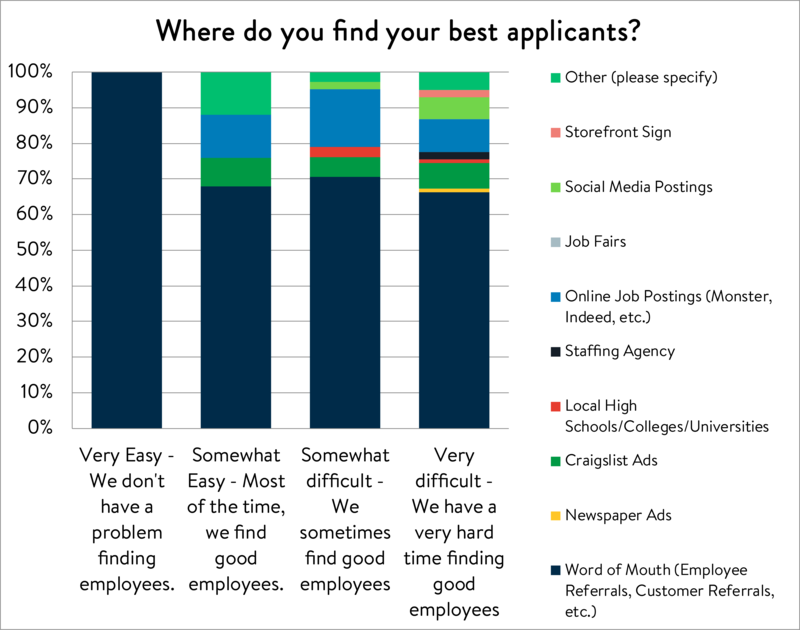 Even worse, when you cross-reference the recruiting tactics of what those who find it Very Easy or Somewhat Easy to find employees, you find that they’re really not doing anything different than everyone else. So when it comes to recruiting employees, there is no magic bullet. So what is a business owner to do? First, try to make your existing employees more efficient and more productive. That’s exactly what software enables you to do. We talked to Kurt Dotson from Greenway Irrigation a couple years ago and he told us he was able to do 150% more work with less people thanks to field service software. There are a number of ways software helps you do more with less. From the moment a customer calls, software makes it easier to troubleshoot, schedule, route and bill your customer. Having customer information always readily available makes everything in your business operate more smoothly. Kurt wasn’t the only one who thought software made him more efficient: The Benchmark Report found that 53% of respondents said software either made their operations more efficient or improved productivity. So one way to avoid the labor crunch is to get more out of your existing staff. Another issue you may face in a tight labor market is employee retention. Some of your employees may start to think the grass is greener elsewhere and, because their skills are in demand, they may find that they can earn more at other businesses. So you need to be able to retain the employees you have. As we saw earlier 43% of survey respondents expect to increase employee wages by more than 3%. That’s a significant increase. And if it’s just a flat wage increase, is that really good for your business? What’s the solution? Incentivize your employees. One way one of our customers does that is by leveraging customer satisfaction surveys. In our software, once you mark a job complete, you can automatically send an email to the customer detailing what was done, when you were there, any notes from your field employees and more. At the bottom of that email you can include a link to a customer satisfaction survey. Your customer clicks the link, completes a short survey, and you leverage those survey results in your incentive program. For example, if your field employees or office staff deliver a score greater than 4.75 out of 5 in a given month, they earn a bonus. It’s a really great way to leverage real customer feedback to measure your performance and encourage customer-centric behavior. According to the Green Industry Benchmark Report, most businesses are seeing revenue increase. 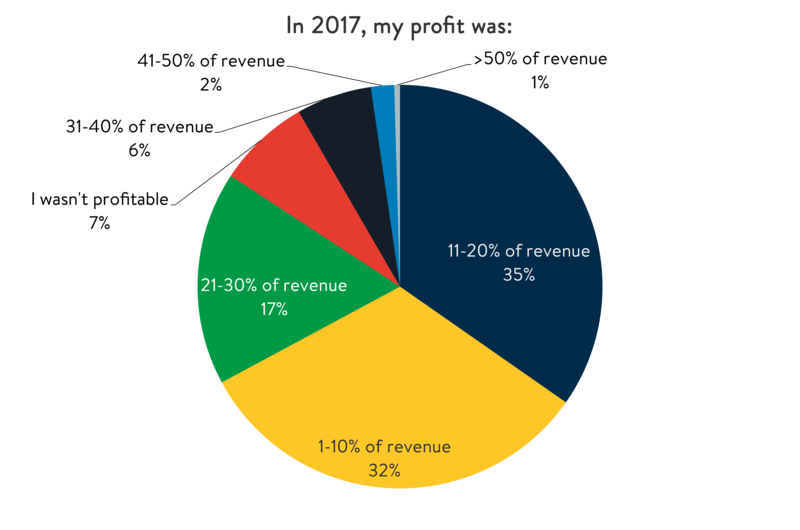 But profitability isn’t really changing. For a lot of green industry businesses, especially smaller ones, they likely are content just knowing they cash flow and there is money in the bank. But that doesn’t necessarily create a sustainable business. Profitability creates a sustainable business. Revenue growth has been consistently strong in the typical green industry business. 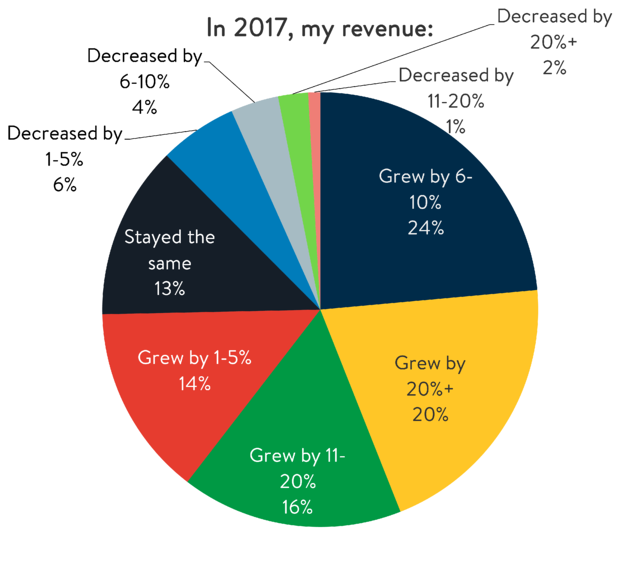 In 2017, 20% of respondents said their revenue grew by more than 20% year-over-year. That’s pretty phenomenal growth. For time and material service work, manage your labor to the minute. Software can help. I’ve heard from a lot of green industry contractors that they know they’re losing money because of the way their team rounds time in the field. They may arrive at a site at 8:52 a.m. and leave at 10:04. They’ll write down 1 hour, when in reality, they were working for another 12 minutes. If you’re charging $75 an hour, you just lost $15 on one job. The easy solution is to have your employees time in and out of jobs electronically in real time. Then you’re capturing every penny that you’re owed. If you’re doing maintenance work, managing labor to the minute means you’re going to want to know how long your crew or employees were working on a job site. Many maintenance businesses don’t track labor time. They merely want to know if a job was complete or not and know their profitability as a whole, instead of for each customer or even each visit. But you need to track all your time and material to get customer-by-customer and job-by-job budget vs. actual reporting so you can see how much you made on each customer, each crew, each service, etc. and adjust at renewal time to ensure you’ve maximized profitability. Without that data, you’ll be unable to make an informed decision. We ask about health benefits every year, and this year we found that 5% more businesses are offering health benefits than the previous year. Roughly 45% of the respondents we asked are now offering some type of health benefit. Why? Because it’s another way employers can attract and retain their employees, which is important in a tight labor market. One health benefit to consider is an employer contribution to a Health Savings Account, or HSA. Basically, an HSA is a tax-favored account similar to a 401K which employees can use to pay for medical expenses. Plus, unlike another popular plan, the Flexible Savings Account, it’s not a use-it-or-lose it proposition. So an employee can contribute money to that account and have it grow tax free if they don’t incur a lot of medical expenses. You’ll want to consult a benefits lawyer, but generally, employers can contribute funds to employee HSAs. So if you don’t want the liability of health insurance, but instead want a predictable contribution to your employee’s health care, HSAs are a great option. Another benefit employees love is paid time off. It doesn’t have to be complex, but setup a paid time-off plan where employees earn hours based on how long they’ve worked at your place of business. Giving someone a week off a year doesn’t impact your productivity too much, and may actually improve it because employees can use that time to recharge and refocus. A final benefit suggestion: Be flexible. If your office staff needs to take off early to go to their child’s softball game or has a sick child and wants to work remotely, let them do it. In the field, consider offering 4 10-hour days instead of 5 8-hour days. Your crews and technicians would likely appreciate the extra day off and you may actually be able to get more work done in those 4 10-hour days as you would in 5 8-hour days. This is especially true of millennials – they enjoy flexibility and are more likely to choose an employer based on the flexibility of that employer. Amazingly, almost 15% of green industry businesses offer no training, though the good news is that almost 25% of respondents train on a weekly basis. So, does training matter? 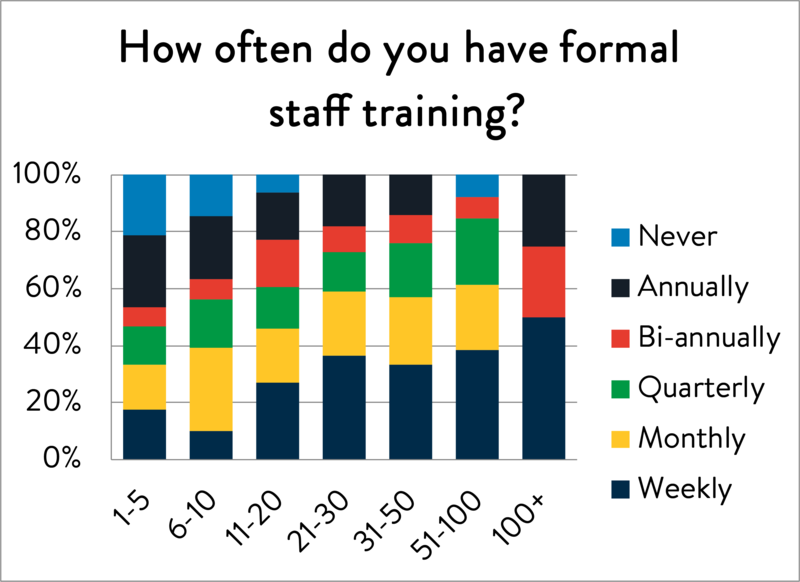 You can see that those that grew by more than 10% were more likely to train more frequently, performing more weekly and monthly training than their industry peers. When training, cover the details first. Everything is important, from how to answer a phone call from a customer to how to find more work on a property. Then, don’t be afraid to quiz your employees. Bill Belichick is notorious for asking his players about minute details in the gameplan or an upcoming opponent’s tendencies on third down. Periodically ask your employees how to do a specific task and coach them if they provide an incorrect or incomplete answer. Finally, have some type of quality control program. We talked earlier about customer satisfaction surveys. One of our customers has said when they first started using them, they discovered that there were common issues that kept popping up in the surveys. They were able to add some additional training, fix the issues and improve their service as a result. Other customers have created what we called assessments. They can either be in the form of a Yes/No question that ensures someone has done what they were supposed to do on a job, or they can capture information in the form of a quality control check that a manager or crew leader can perform rating the work. By using those customer satisfaction surveys and quality control assessments, you’ll be armed with plenty of data to conduct bi-monthly or even weekly training sessions with your staff and be on the way to producing better service and better customer satisfaction. When we examined the data from the 2018 Green Industry Benchmark Report to determine the biggest predictor of high revenue growth, we weren’t surprised. For the sixth year in a row, those with software grew their revenue much faster than those who weren’t using software. So, invest in software because it can make a huge difference in your business and deliver big ROI. First, consider that 50% of our respondents said they use software. It’s nearly 75% for those with more than 10 employees. So if you have a business of any size and aren’t using software, you’re likely at a disadvantage because your competitors are more than likely using software. We saw earlier that the #2 issue in the typical green industry business is inefficient operations. Guess what? Software can help you with that. 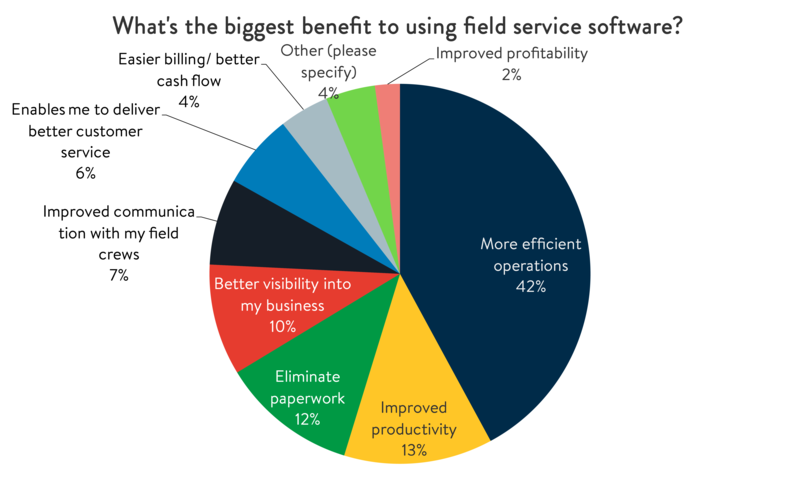 42% of people who use software said it makes their operations more efficient. 13% said it improved productivity. So if you’re having a hard time finding employees to do the work, software can help make the existing employees you have more efficient. As an example: Our owner had an irrigation business prior to starting HindSite. He found that he was only earning money on about 50 to 60% of the time that a typical irrigation technician was being paid. After he implemented software, that number was as high as 80 to 90%. He was able to earn a lot more money out of his existing staff, and this was in the late 90s. Today, software is much more functional than it was back then. And the results are obvious. 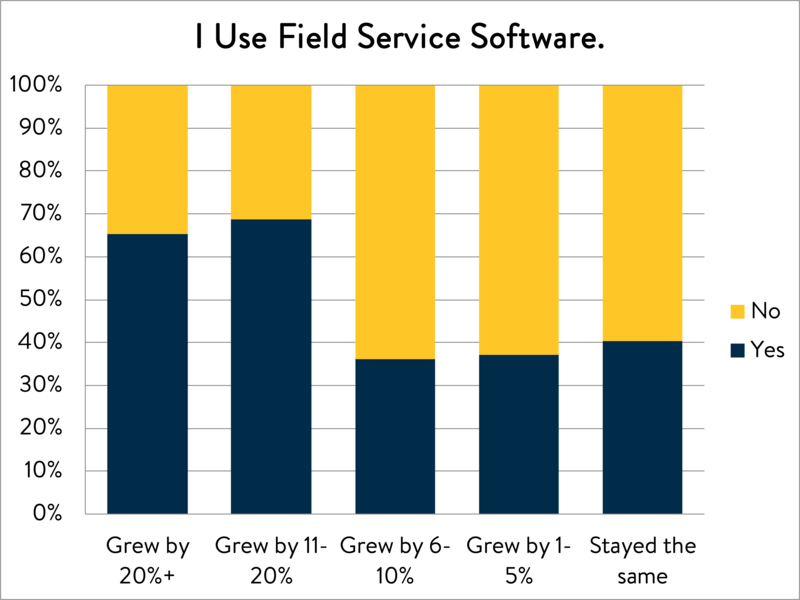 About 70% of those that experienced revenue growth of more than 10% year-over year also used software. Of those that grew by less than 10%, about 38% were using software. So high-performing companies were much more likely to say they were using software than their slower growing counterparts. Want to learn more? 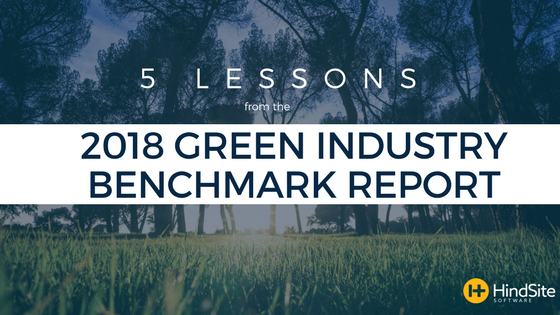 Then download the 2018 Green Industry Benchmark Report or watch a recording of our 10 Lessons from the 2018 Green Industry Benchmark Report webinar.